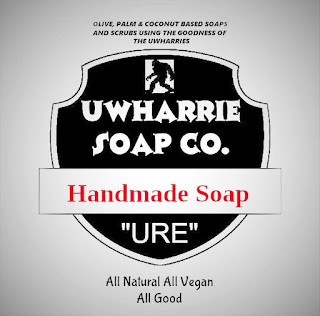 Today we have a new shaving soap from a company call UWHARRIE Soap Co. I first heard about this on my facebook page with a video that Pete Bellanger had posted and he was demoing the shaving soap. He announced he would be starting to sell them and went on to talk about the quality of them. I was intrigued so I asked Peter if it would be possible to get a sample for a review and he agreed. When I opened the sample which comes in an envelop I noticed that this was a glycerin soap commonly known as a melt and pour. Since I didn’t have the box or container I had to refer to the website for additional information but as hard as I tried I couldn’t find any nor could I find a picture or any products or shaving. I wanted to see how the soap was made but it looks like we are going to have to wait on that. The puck size is 2oz and goes for about $5.00. The nice thing about them is you don’t need a lot to load your brush loading happens in just a few seconds so it should last a good long while. The scent on this is cucumber and what a sent it is. Absolutely fantastic on the scent alone I would give this soap a big thumbs up. They have many other scents available which I’m sure are on the same fantastic level as this one. I bowl lathed and it created an amazing amount for the small sample given to me. It fast to lathered and once I started to applied it got right into the beard. Not every soap I use is going to perfect and the only thing I would say to do when using this is to add a little extra cushion maybe a pre-shave oil would do the trick other than that it was a perfect shaving and the post shave fell was a good one. This would change from person to person so other might not need that extra help the pre-shave oil provides.